Gnocchi, those tender little Italian dumplings, are the cousin to these much easier-to-make malfatti ricotta dumplings. In Italian, malfatti translates to "bad made" because of their rough shape, however, these delicious dumplings are anything but bad - and much easier to make than gnocchi. They're so easy, in fact, that you can easily whip these babies up on a busy weeknight. If you can drop dumplings into a simmering broth, you can make ricotta dumplings. This recipe is based on one I found in this month's issue of EatingWell. I changed it up a bit to make it gluten-free and made the formation of the dumplings a bit easier, I think. EatingWell's recipe called for forming the dumplings into quenelles (football-shaped dumplings using two spoons), but I found the batter to be a bit too loose for this (I could have added a bit more gluten-free flour to firm them up a bit, and you absolutely could do this, but I wanted to keep them as light in carbs as possible). Instead, I simply dropped the dumplings directly into the simmering water a la chicken and dumplings style. The boiled dumplings are then tossed in a pan with a bit of olive oil until they are nicely browned. This adds a nice crispness to the light and fluffy center. 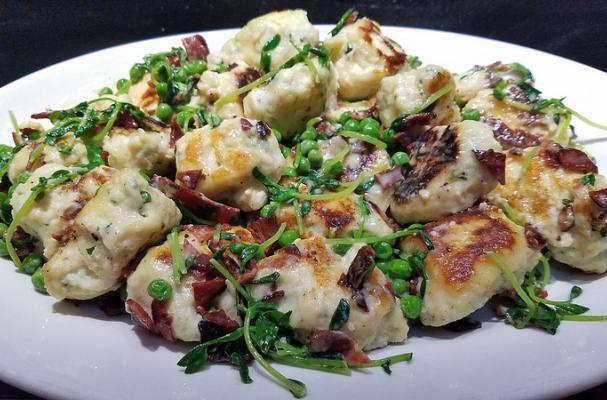 Toss your dumplings in a bit of cooked cream with bacon, peas, and pea shoots, if you can find them, then generously garnish with a good Parmesan cheese. A bit of freshly cracked black pepper goes nicely as well. Bring a large pot of water to a slow boil. Stir together the ricotta, egg yolks, flour, basil, salt and pepper. Using two tablespoons, carefully drop a large spoonful of batter into the boiling water (scoop with one spoon and scrape off batter with the other). Cook half the dumplings until they begin to float, about 2-3 minutes, then remove with a slotted spoon to a paper towel-lined plate. Heat 1 tablespoon of olive oil over medium heat in a large non-stick skillet. Add half the dumplings and cook, flipping once, until browned on both sides, about 5 minutes total. Remove to a clean plate and repeat with the remaining 1 tablespoon of olive oil and dumplings. Add the bacon and garlic to the skillet and cook, stirring frequently, until fragrant, about 1 minute. Add the peas, cream and pea shoots and cook until the cream thickens, about 2 minutes. Add the dumplings to the pan and gently stir to incorporate. Transfer to a large serving platter and garnish with Parmesan cheese.